We are very grateful to all the CVS organisations, infrastructure charities and individuals who have helped to promote the Beacon Programme so far. With your help we have reached hundreds of Chairs / Vice Chairs of smaller charities. The programme of workshops launched in September 2018 and we now have dates booking well into 2019 in nine locations across England as well as webinars for those who can't attend in-person. A workshop travel bursary is available for organisations under £100k if booked a month ahead. Here are four tweets you could share. If you are based around our nine workshop locations, could you share details of specific events? Our workshops are held in Birmingham, Cornwall (Bodmin or St Austell), Bournemouth, Brighton, Leeds, London, Manchester, Newcastle and Somerset. See our Beacon events calendar or our Twitter feed for more information. Or if you want content-based copy, have a look at our blog post based on feedback from module 1 workshops - What keeps Chairs of smaller charities awake at night? 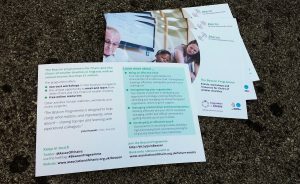 If you are holding an event or doing a mailout, we have a supply of postcards which you could share. Please contact us (via info@associationofchairs.org.uk) for more information.